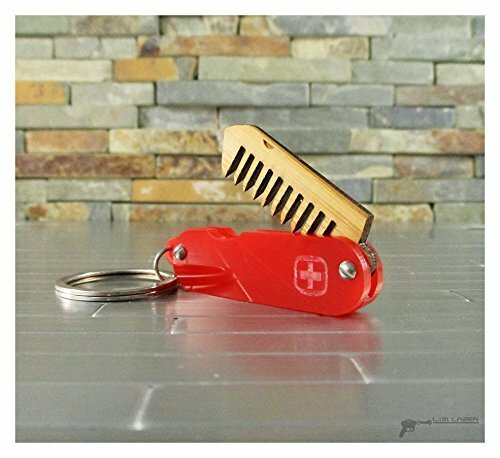 This listing is for a single , mini folding Mustache comb; it has been laser in vibrant red acrylic and cut from an original design meant to mimic a Swiss Army knife when closed. It features a single blade in bamboo, with close tines for precise grooming; it is then detailed, sanded and finished with a light coating of organic mineral oil and beeswax. Closed it's about 2 1/2" x 3/4". The bamboo we use for the comb "blade" is a very strong and flexible plywood, comprised of 5 "piles" or layers of alternating grain. The acrylic is cast and has a smooth, glossy finish. Typically, we use 1/8" thicknesses for a single layer of materials unless noted otherwise in the description. View More In Beard & Mustache Combs. If you have any questions about this product by L.I.M. Lazer, contact us by completing and submitting the form below. If you are looking for a specif part number, please include it with your message.